I relocated from Pune to Gurgaon i.e. Maharastra to Haryana. So I want new Haryana registration number for my bike to avoid any hurdle from Gurgaon police. 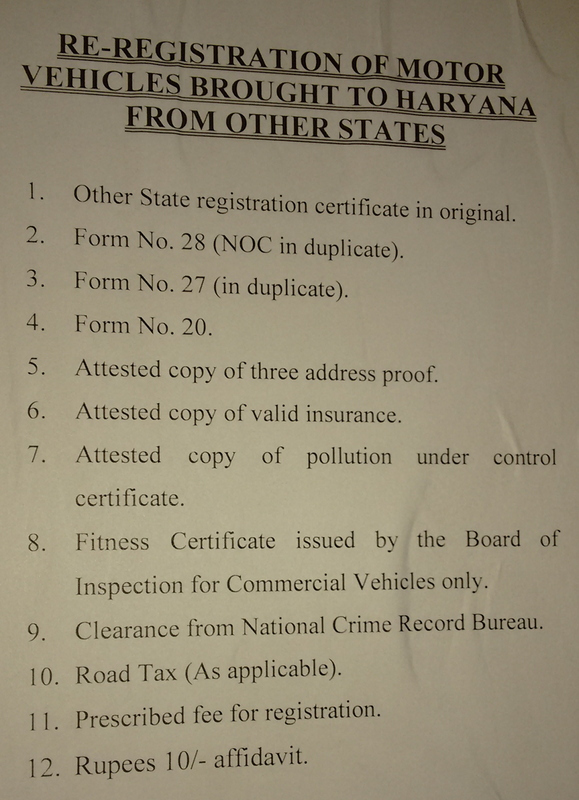 This process known here as re-registration of vehicle brought to Haryana from other states. I received my NOC from Pune. If you want to know how to get NOC from Pune RTO, please read my article from here. You need 3 different local address proof of Gurgaon. I submitted Bank passbook, Rent agreement, Gas connection copy. 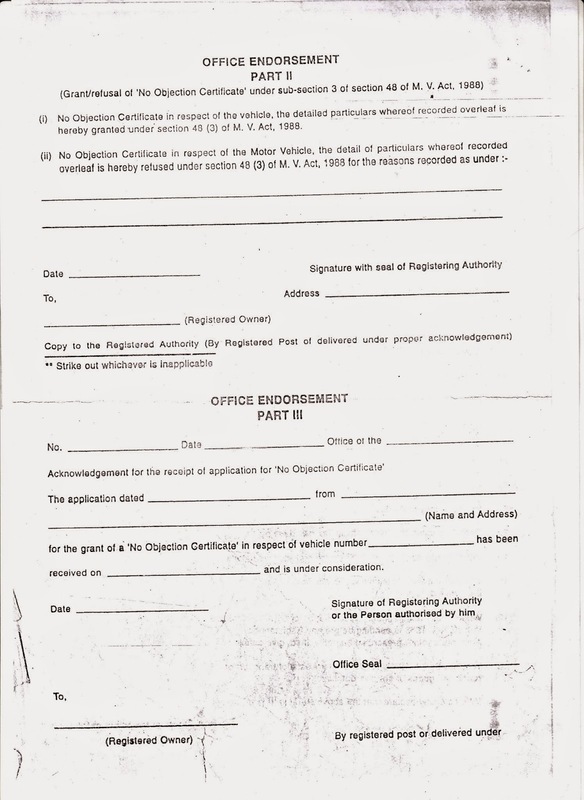 If you r submitting Company letter then u have to attach ID card Xerox as well. 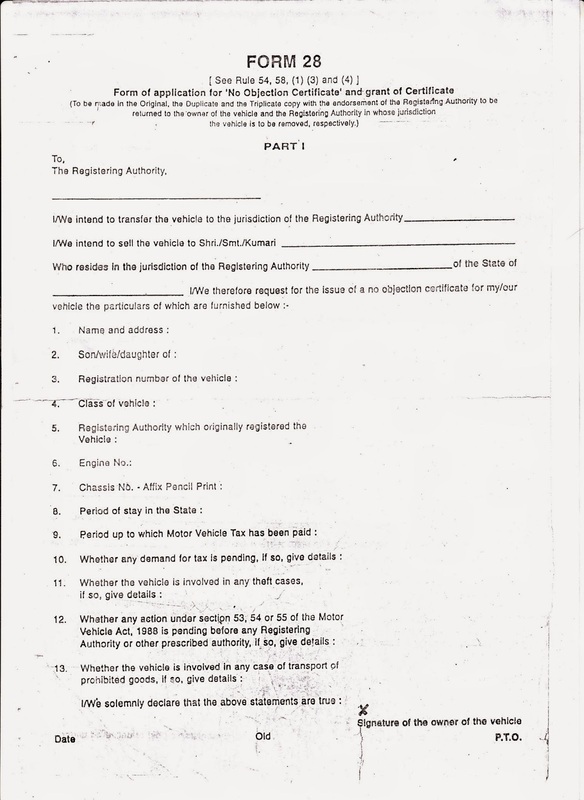 Just fill submit Name, City, Vehicle Type, Vehicle Make, Registration No. like MH31AB1111, Chassis [Only last 7 digit], Engine No [last 8 digit] and take the 1 printout. First thing in Gurgaon RTO is inspection of your bike and NOC letter. Your bike chassis no. must match with chassis no. mentioned on NOC. When I tried to submit my NOC in Gurgaon RTO, the inspection guy rejected it as my chassis no. on NOC was not complete. Unfortunately last 3 letters are missing. Gurgaon RTO can’t do anything here. 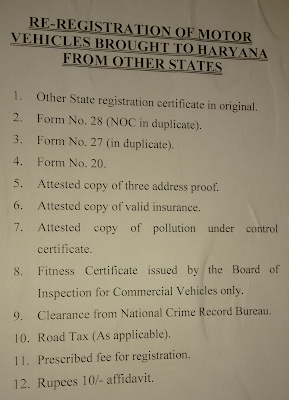 You have to get either new NOC or Pune RTO should write the missing number with RTO seal on your current NOC. This was not possible for me to visit to Pune again just for this. So I mailed my all related bike paper with NOC to one my friend in Pune. Fortunately he corrected the number from Pune RTO and courier me the new NOC document. · Take Form 20 and one file from first counter. He will charge Rs. 10 for it. · Inspection of bike - This time inspection guy approved this new NOC, bike and he signed on the paper. · Submit all papers to RC counter 1. · From RC counter 1, you have to visit to Right corner person Vikas to verify your NOC. He provides you the verification report print out. · After this you have to submit the fees at fees counter. In my case it was Rs. 2410. I had not that much of amount at that time so they kept my file and told me to withdraw money from outside ATM. They are not accepting any debit, credit card. So I suggest you all guys that always keep money around 3000 Rs. with you. From fees counter I submitted money and they issue the receipt. · I attached the receipt to file and again submitted to RC counter. This time they issue me one useless small paper on which they mention the date of 25 days ahead and told me to visit on that date for RC. Take care of this paper as it is very important otherwise you have to face lots of problem to receive the new RC. I changed my bike number with this new number and now I can move to anywhere in Haryana and Delhi NCR area without any tension. Please leave your comments or share these tips if it’s useful for you. Recently I want NOC from RTO for moving my vehicle. For that one need form 28. If it’s a state wise transfer then you need 3 copies of Form 28 for inter-state, we require 4 copies. RTO in India is the perfect example of mismanagement. RTO Employees are worst and local agents are best. But I tried to get NOC from my own. First problem I faced to get form 28. RTO office has form 28 copies but all are in Marathi. If you demand for English one then RTO employees show you the route of Xerox shop where shop guys selling it in 4 Rs. You can even download form 28 from RTO website, but the worst thing is that it’s a 3 page PDF while actual form is only 2 pages which should be printed on both side of paper. Here is scanned copy of form 28 that I got from Xerox guy. Download it free and take a print. That’s it. No need to pay 4 Rs. to those greedy people. Please leave your comments or share this if it’s useful for you.